Virginia Lieutenant Governor Justin Fairfax has been accused of sexual assault by two women. RICHMOND — Justin Fairfax’s refusal to resign as lieutenant governor of Virginia in the face of two allegations of sexual assault has presented Democrats with an excruciating choice: whether to impeach an African-American leader at a moment when the state’s other two top leaders, both white, are resisting calls to quit after admitting to racist conduct. Less than a week after Governor Ralph Northam and Attorney General Mark Herring admitted to wearing blackface as young men, Fairfax on Friday faced a second detailed assault accusation. On Saturday night, Fairfax called on the FBI to investigate the allegations and asked that “no one rush to judgment” and for “due process.” But he is under intense pressure to resign or face impeachment, transforming what had been a crisis for Virginia Democrats into a searing dilemma for the national party. The political turmoil for Democratic leaders is unfolding at the intersection of race and gender, and risks pitting the party’s most pivotal constituencies against each other. If Democrats do not oust Fairfax, at a time when the party has taken a zero-tolerance stand on sexual misconduct in the #MeToo era, they could anger female voters. But the specter of Fairfax, 39, being pushed out while two older white men remain in office — despite blackface behavior that evoked some of the country’s most painful racist images — would deeply trouble many African-Americans. “I think the Democratic Party would lack credibility if they followed a double standard,” said Representative Karen Bass, a California Democrat who is head of the Congressional Black Caucus. Bass said that both Northam and Fairfax should step down. In another sign that Fairfax will attempt to remain in office, he has added an African-American woman from the state’s most politically influential law firm to his legal team. The woman, Ava Lias-Booker, is a partner at McGuireWoods who, like Fairfax and Watson, graduated from Duke University. 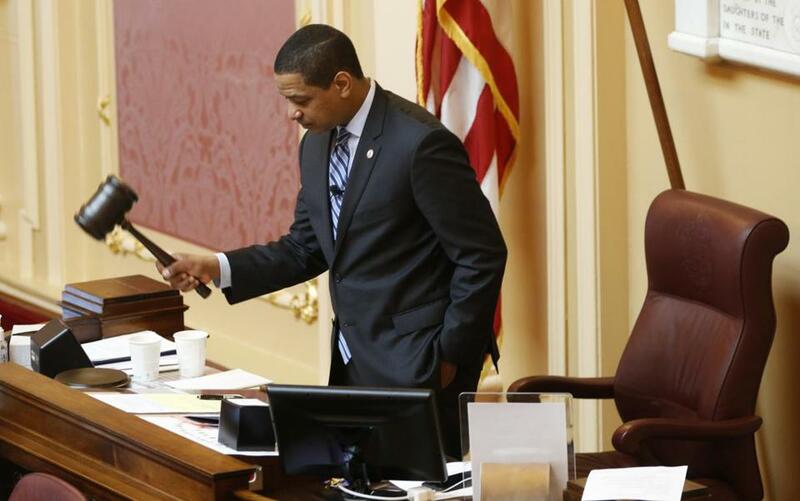 Almost all of Virginia’s Democratic leaders and lawmakers on Friday called on Fairfax to resign and a legislator vowed to introduce articles of impeachment if he did not quit by Monday. The state Democratic Party, after a conference call of its steering committee Saturday in which there was near-unanimous support for Fairfax to resign, issued a statement saying he no longer had “their confidence or support” and should quit. Fairfax has said he is innocent and will not step down. Northam also insists he will not resign. He does not face an imminent impeachment threat, and neither does Herring, the attorney general, who has been effusively apologizing for once wearing blackface. Some Democrats here said they must begin the process of emerging from the wreckage that is the executive branch of Virginia government by turning to perhaps their most loyal constituency: black women. McClellan, who is black, is a longtime Richmond legislator who was thought to have statewide ambitions and has a close relationship with Tim Kaine, Virginia’s junior senator. On Saturday, an adviser to Northam said the governor was not yet considering McClellan or any potential appointees for a post Fairfax still holds.